My thoughts on Mayor Tory’s ten-point plan to deal with subway crowding. Over on the Torontoist site. The SSE itself is not on the agenda, but it has been the subject of much recent debate over when the projected cost and schedule for the extension will be released. EFC [Estimated Final Cost] was approved in 2013 based on 0% design. With the alignment/bus terminal now confirmed by City Council, the project budget and schedule will be confirmed as design is developed to the 30% stage, factoring in delivery strategy and risk. The performance scorecard will continue to report relative to the project’s original scope, budget and schedule, as approved by Council in 2013, until the project is rebaselined at the 30% stage in late 2018. In other words, neither the schedule nor the projected cost reflected the evolving and expanding design of this project. Jennifer Pagliaro in the Star wrote about the result of a Freedom of Information Request that revealed a briefing to Mayor Tory in September 2017. That briefing included a statement that the cost estimate for a Stage 3, 30% design, would be available in September 2018. 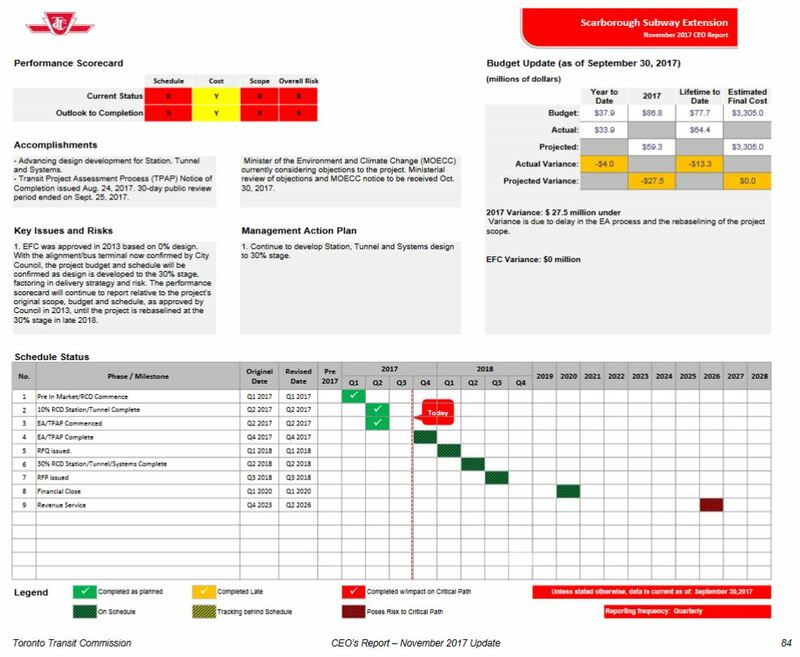 The cost information referenced in page 9 of the October TTC briefing deck refers to the planned timing for initial cost inputs from TTC engineering staff. These are not the full cost estimates necessary for consideration by Council. Further work will be required to appropriately account for financing, procurement model, market assessment and other critical factors. The final cost estimate, subject to the variability ranges noted below, will include these inputs. Work continues to progress design towards Stage Gate 3, expected in fall of 2018. At this time, the project will provide initial cost inputs from the TTC team (includes detailed costs for the Scarborough Centre station, tunnel, Kennedy station, systems, property and utilities). Further work is underway by the new Chief Project Manager with key stakeholders within TTC and the City to define the activities, approval process and timelines to arrive at the final Class 3 Cost Estimate, Level 3 Project Schedule, and associated Risk Analysis. The debate, as it now stands, is about releasing whatever material will be available in September 2018 so that it can inform the election debates. Additional costs as cited by the city would sit on top of the September numbers, but at least voters and politicians would know whether the SSE’s cost has gone up just for the basic construction, let alone factors related to financing and procurement that would be added later. I don’t think it matters what the costs are. What De Baeremaeker does not address is whether he has an upper limit beyond which even his enthusiasm might be dimmed. Also, on the question of a “reasonable cost”, what has been lost here is the fact that the subway “deal” was sold on the basis that the $3.5 billion included the Eglinton LRT extension to UTSC Campus. What had been a $2 billion-plus subway when it was approved as a compromise by Council, quickly grew to $3 billion-plus, and the LRT extension is left to find alternate funding. One could reasonably ask whether the LRT was ever really part of the deal, or was simply there as a sweetener that pulled in wavering supporters who now see just how gullible they were. 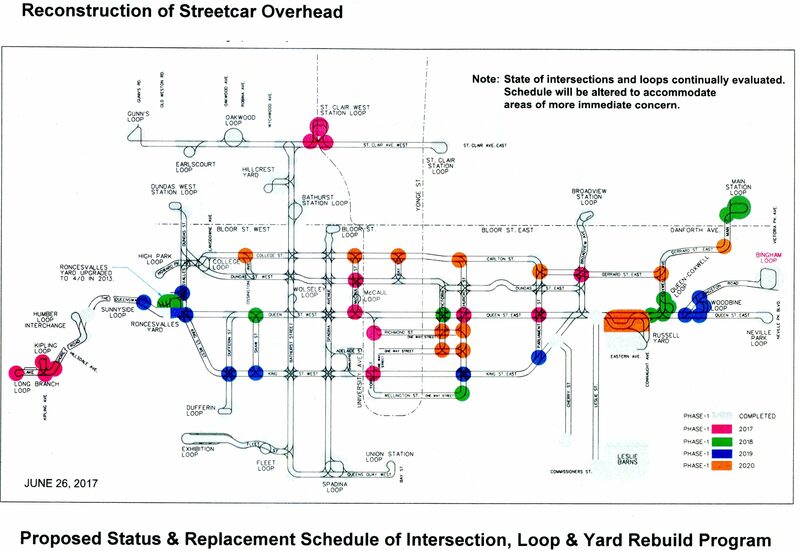 A related issue that has not yet surfaced is the question of whether building the SSE for a 2026 opening will require concurrent changes in timing and/or scope for the planned renewal of the Bloor-Danforth subway including a new signalling system and fleet. A report on the renewal is expected in April 2018, although this date has changed a few times over past months. 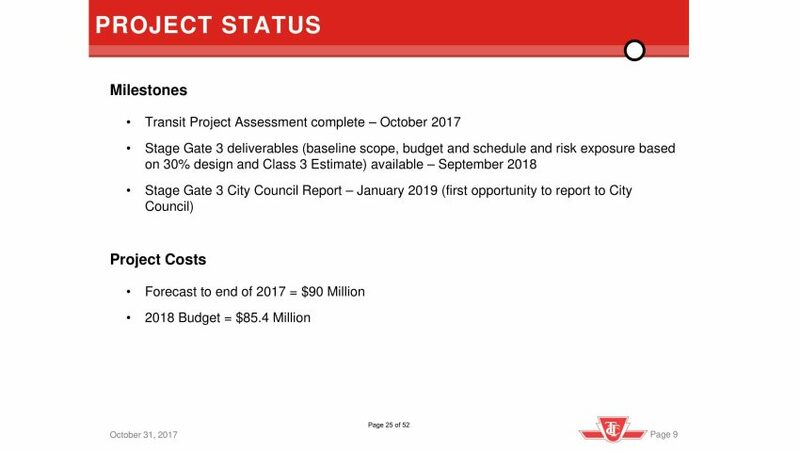 The TTC/City capital budget and ten year plan do not reflect this project, at least with respect to timing, and probably with respect to total cost. 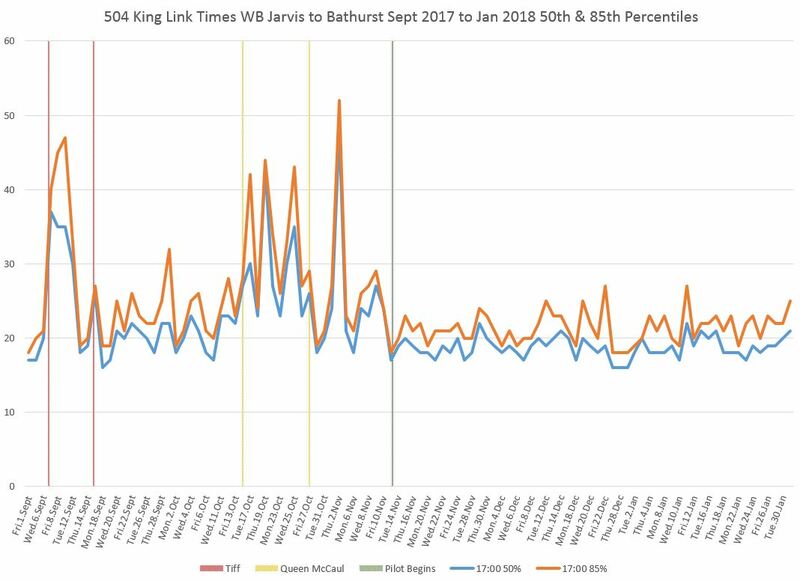 Updated February 5, 2018 at 2:30 pm: Charts showing comparative travel times between Jarvis and Bathurst for the period from March 2016 to January 2018 have been added to give a longer context to the effects of the King Street Pilot. Scroll down to the end of the article for the charts and commentary. 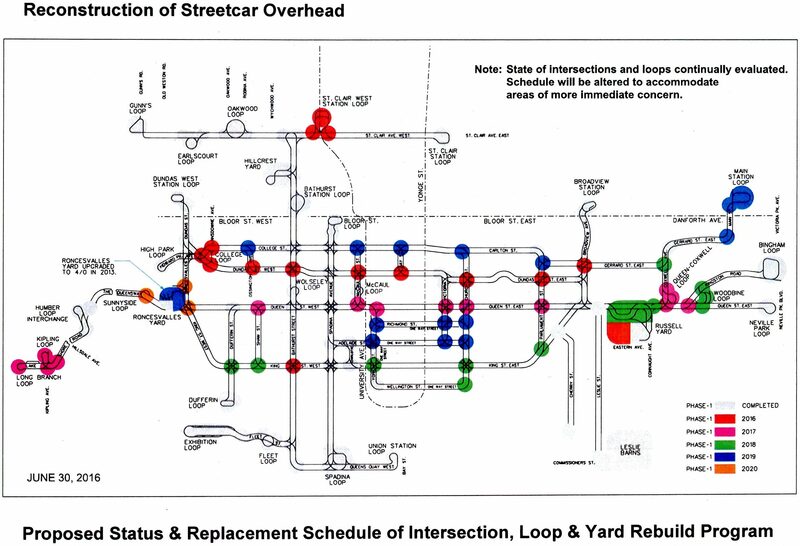 This article updates previous posts about the effect of the King Street Transit Pilot on TTC vehicle movements. Please refer to previous articles for commentary on the transition from the pre-pilot to pilot results and for the period up to the end of 2017. 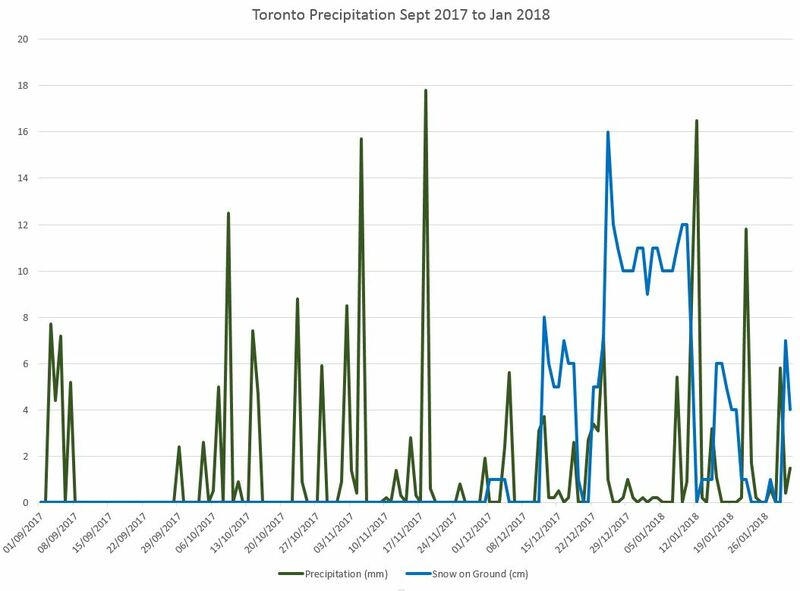 Data for January 2018 show that the travel times through the pilot area between Jarvis and Bathurst Streets continue to be both below the pre-pilot values, and generally without the day-to-day “spikiness” in the range of typical travel times. The sample below shows the travel times for westbound vehicles crossing Jarvis Street between 5:00 and 6:00 pm from September 2017 through January 2018. Horizontal lines give the daily values, while vertical lines bound periods where conditions changed. The blue line is the 50th percentile where half of the trips are above and half below.These two lines are close together because the data values are clustered over a short range in most cases, and so one gets from the 50th to the 85th percentile with a small increase in travel times. Where there is a gap or the value drops to zero (no examples on this chart), there were no vehicles making the trip on the day and hour in question due to a long delay or diversion. The two sets of charts linked here contain data for five representative hours of operation starting at 8:00 am, 1:00 pm, 5:00 pm, 8:00 pm and 10:00 pm. These are in the same format as previous charts except for the addition of one month’s data. With recent events of major subway delays and discussions at the TTC Board about a “Ridership Growth Strategy”, the whole question of “what can we do” is swirling through the Toronto media and online. This article is an attempt to pull together threads from several reports and discussions. This is a very long read and I salute those who stay the course to the end. In brief, there is a capacity crisis on every part of the TTC system that is the product of years of pretending the problem is not as bad as it looks, and that a few magic bullets can solve everything. 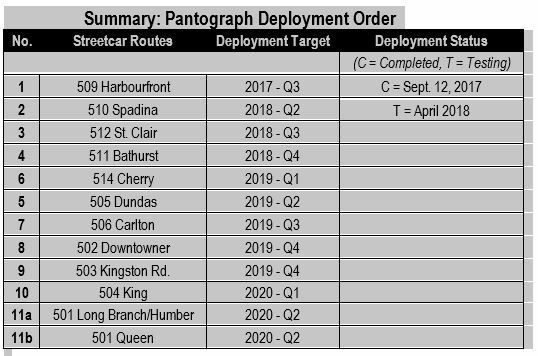 This is compounded by underinvestment in the bus network, by Bombardier’s sluggish delivery of new streetcars, and by subway planning that leaves major components either unfunded or missing from the long range capital plans. There is no easy fix to any of this, but that is no reason to throw up our hands in hopeless resignation to further decline of our transit network. Recovery has to start somewhere even though the benefits will take time to appear. Politicians are afraid of spending money and driving up taxes. Staff act as enablers by concocting budgets that fit within available funding. The numbers “come out right” only because we ignore the full scope of our needs and how badly we have deferred addressing them. This article does not propose specific remedies, but sets out the history of what has been done (or not done) over past years. Reading through all of it, I cannot help thinking that “Ridership Growth” is a laughable goal considering how hard Toronto has tried to stifle transit’s capacity and attractiveness. But at least the TTC Board is talking about trying to build more demand on its system. To do that, they must first acknowledge the accumulated shortfall between transit we think we would like and transit that is actually on the street. Although the 2003 RGS was recently dismissed by current TTC Chair Josh Colle as if it were yesterday’s answer to transit problems, the context in which it was written is as fresh today as it was 15 years ago. There is a growing expectation that transit in general, and the TTC in particular, must take on an increased role in providing travel for people in Toronto if the City is to grow and thrive economically and in an environmentally-sustainable way. Each level of government has recently announced plans and policy initiatives, that highlight the need for greater use of transit in urban areas – the City with its Official Plan, the Province of Ontario with its “Smart Growth Council” and “Gridlock Subcommittee”, and the Government of Canada with its approval of the Kyoto Accord. Achieving these policy objectives will require a fundamental shift in transit’s role in Toronto and the relative importance of automobile travel. Unfortunately, these initiatives follow on the heels of a consistent lack of government support for the TTC in the past decade. Provincial funding was reduced a number of times in the mid-1990’s and is only now being partly restored. The TTC’s ridership and market share has fallen significantly during this period, to a large extent because of lack of government support. While there is no simple “magic answer” that will reverse this trend, government support for the TTC must be real and pronounced if the current widespread public and government expectations for improved transit are to be met. Looking after the system and riders we have today is essential to attracting new riders. Investing in improved transit service makes sense for many reasons, but it must be done in a way that provides significant, measurable, and real returns on investment. If taxpayers’ funds are to be used to improve transit services, there needs to be a strong business case to prove that the money is well spent, and that any funding provided will generate significant additional ridership. There is no simple, low-cost solution to achieving increased transit ridership, or to reduce congestion and pollution. Attracting new riders to transit will require substantial increases in government policy commitments and subsidy, on a consistent basis, over a number of years. One-time funding arrangements and individual mega-projects will not result in significant changes in overall travel patterns over the long term or over a wide area. A consistent, long-term, staged program of providing priorities for, and investing in, expanded existing transit services, using proven technologies and operating strategies, provides the best opportunity to achieve sustained increases in transit ridership. 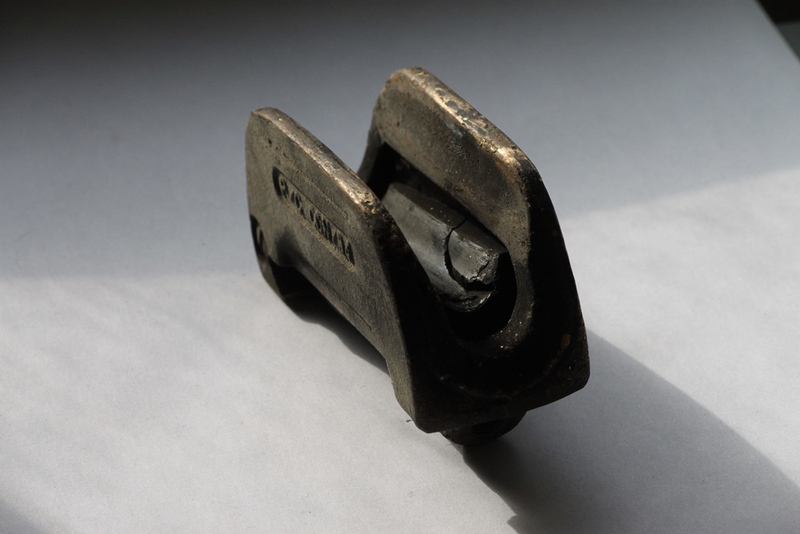 The key factors governing mode choice are speed, reliability, comfort, convenience, and cost. Different segments of the market put differing values on these factors, and an understanding of market segments is critical to determining the potential for attracting transit riders. In addition, some modes of travel are simply not available or practical for some trips – few people will make very long walking trips for example – and people do not necessarily have an automobile available for any given trip. The availability and attractiveness of various modes is also very dependent on the location of both the origin and the destination of the trip being made. The situations where transit can compete effectively with automobile travel are those where there is good pedestrian access to transit at both ends of the trip, and where transit can provide comparable speed to automobile travel when all factors are considered. Under these conditions, transit travel becomes attractive to many potential users. 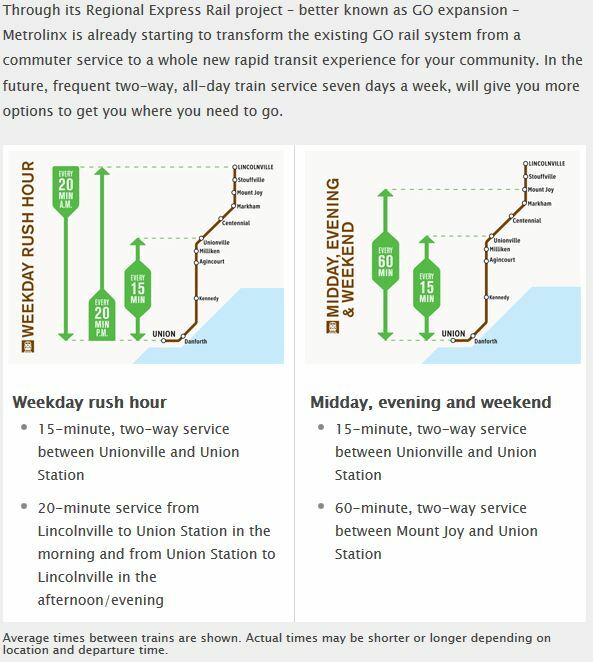 These conditions exist for travel to and from downtown Toronto in peak periods, where the roads are congested and rail lines (GO and subway) provide a comparable travel speed to automobile travel. There is also excellent pedestrian access from the downtown rail stations to destinations in the downtown. Transit achieves a 60%-to-70% mode split to transit in these favourable circumstances. There is an obvious problem with this observation, and it applied even in 2003: much GTHA travel is not oriented to downtown and its concentrated destinations, and riders will not fall into transit’s lap simply because this is the obvious way to travel. Indeed, in many cases transit will be the last, not the first, choice. This begs the question of whether there are some trips for which making transit even grudgingly acceptable simply is not economic, but at the same time whether there are trips that are poorly served by a downtown focus on travel. This question is not new to transit debates. If we abandon trips that are harder (or more expensive) to serve, or provide only minimal service to “show the flag” with a route map whose many lines hide less-than-ideal service, do we risk alienating potential riders especially in an era of population and density growth? Market conditions could evolve to give transit a greater role provided that it is there to establish credibility and a base of demand. This is not just an issue for the far suburbs in the 905, but for areas in both the outer 416 and in more central, redeveloping industrial neighbourhoods.